There’s something about handmade work that is very special to me, and I hought I’d take a few minutes to unpick why that is, and share it with you. 1. Handmade means made by hand! The US Federal Trade Commission says that this means that any tools or machinery used must be guided by the human hand. This means that nothing about the process has been automated. 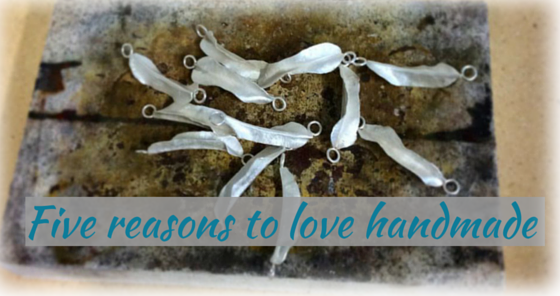 For me, one of the special things about handmade jewellery is that it starts with the simplest raw materials. I was completely naive about this when I first started. In fact, my first pieces were simple chain maille designs made with cheap, silver-plate jumprings that I bought in a hobby shop. The pieces looked lovely, for a few days, until the plate started to wear off. I soon started to feel dissatisfied with what I could do with these components and then a jewellery teacher appeared in my life. Until then, I didn’t realise that you could simply order bullion through the internet. I can’t tell you how excited I was the first time a shipment of silver sheet dropped through my letterbox. And as for the first time I ordered diamonds…well! Everything I make starts out as a flat piece of silver, or as a length of silver wire, or a combination of the two. I transfer my designs onto the metal and cut them out by hand. Sometimes I use techniques like etching to pattern the surface of the metal. I use soldering (mainly with a little butane torch like you might use in your kitchen) to join the pieces of metal securely together. Some pieces can take several days to make. 2. The pieces don’t look the same! If you use a machine to stamp pieces out, or if you use moulds to mass-produce cast pieces, then they will all be identical. This is really important to the big jewellery companies – they need their products to be uniform and standardised. When you make things by hand, they will never be exactly the same (though we can work to very challenging tolerances!). For me, one of the beauties of handmade jewellery is that each piece, in its own way, is unique. I worked in a factory once, for a very short time. My job was to smooth off china ornaments as they came out of the moulds. It was repetitive and not terribly satisfying. The fact that I broke more than I completed to standard probably didn’t help either. I soon decided that production line work was not for me. Each of my pieces is made with love and care. I really do mean this. I do produce some designs in multiples – things like earrings for instance. So, isn’t that a kind of production line? Well, no. I make pieces in quite short runs – probably no more than ten at a time. While I’m working on each piece, I enjoy the gentle rhythms of sawing and filing, sanding and polishing. Most jewellers I know will tell you that this can be quite a meditative process. Until your saw blade breaks, or you run the file over the end of your thumb, that is. But then I tell myself that’s the Universe reminding me to pay attention. I feel affection towards each piece that I work on and that makes me want each piece to be as well-made as I can manage. This has taught me some useful lessons about being proud of what I produce now, and not comparing myself to people who are years ahead of me in experience. I also try to hold the potential wearers of each piece in mind. I have a funny belief that some of the love that I put into the work will transmit itself to the person who wears it. I want there to be joy in the pieces, not tiredness or resentment and this reminds me to take care of myself while I’m working. The deepest satisfaction is making a piece for a specific person. I used to think that commissioning a piece of jewellery would be well beyond my means…until I talked to an actual jeweller (who ended up being my teacher). She laughed, and said ‘No – you set your budget, and the jeweller works to that!’ So I might be making one of my simplest, least expensive pieces – and if I’m making it for someone I know that brings me real joy as I picture them wearing it. Commissions for wedding rings generally have me in happy tears at some point! In fairness, there are some components in my jewellery that are mass produced. This is because it would be beyond me to make extremely fine chains for pendants, for instance. There are some fittings, like cuff-link swivels, that I would struggle to make well. The main parts of my pieces, though, are always handmade and made in small numbers. I could assemble mass-produced components to create beautiful pieces of jewellery, but I choose not to. Why? I love the process of getting an idea in my mind for a design and then gently thinking about how I could make it come to life. This can take some time – I’m not confident with sketch-books and I prefer to let the idea stay as a picture in my mind. Gradually, I start to see the steps that I need to go through to create the finished piece. Sometimes it’s like solving a puzzle and I get a deep feeling of satisfaction when I think ‘Aha! Now I know how to make it!’. Sometimes, of course, I need to do some actual research into techniques and approaches! I can’t describe the feeling I get, though, when I look at a finished piece and compare it to the original mental image and think, ‘Yes, this is what I intended!’. This reminds me about the power of intentions. If they are clear, and held gently in your mind, they will manifest. I also love the actual process of making. Of seeing a piece start to emerge. Of feeling the tools shaping and smoothing the silver. Of feeling the texture of the silver become silky as it’s polished. To my surprise, I also love direct selling at fairs. I have the loveliest conversations with people, and I can feel my heart swelling when I can tell that someone completely gets and appreciates what I’ve tried to achieve with my designs. It’s a wonderful feeling and I wouldn’t swap it for anything.